Although we've been experiencing the most beautiful weather this last week, I have been stuck inside with a sick little munchkin, as well as feeling a little sick myself. So when I found out I had to take a dessert to our neighborhood HOA meeting tonight, I decide to make these beautiful little cupcakes. They are quick, easy, and like a little burst of sunshine in your mouth. I know I just recently posted another cupcake recipe, but I just love cupcakes especially mini-cupcakes. They're the perfect size so you can have just one and still feel good about it. They're also great for those of you out there that don't think you can bake. All you need is a box cake mix and little imagination. 1. Mix cake as directed on the box. 2. Add 1 t. lemon extract and Substitute ¼ C. of the liquid with lemon juice (some call for milk and some call for water). 4. Divide batter into cupcake pan (1 box should make 24 mini-cupcake). Bake at 325 degrees for 15-20 minutes. 5. When the cupcakes finish baking. Allow to cook for 10 minutes then remove them from the pan. Allow to cool for an additional 10 minutes. 6. When cool, place them back into the cupcake pan and use a fork to poke several holes in the top of each cupcake. 8. Use a basting brush to spread syrup over each cupcake. 9. 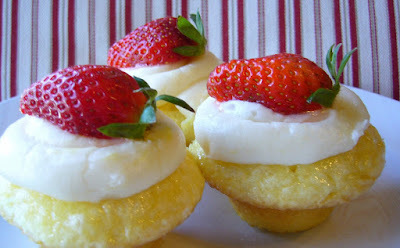 Frost with lemon frosting and garnish with strawberries. 1. Mix butter, lemon zest and vanilla until well combined. 2. Add 2 C. of the powdered sugar and mix well. 3. Add ¼ C. of the lemon juice and mix well. 4. Continue to add powdered sugar and lemon juice alternating until desired frosting consistency. Yes please. These sounds delicious!!!!!! Wow!! !